Steingraeber is one of the world’s great pianos and I do not expect anybody with credibility to disagree with me. Like the other pianos at this level it has its own sound and style which may or may not appeal to you, but it is a great piano in any technical regard and has won enthusiastic followers the world over. I really love the Steingraeber piano. I’ve played and worked on many and have found them to be amazing pianos in quality of construction and tone and touch. I love the white key bushing felt instead of the customary red. I personally am reluctant to shape hammers with the extreme diamond point that frequently comes out of the factory, but I will happily maintain such a shape if Steingraeber says I should. Udo Steingraeber is one of the great men of the industry and Alex Karsten, his Klavierbaumeister, is skilled, friendly and down to earth. One of the unique features of Steingraeber is the cymatic process their soundboards undergo. A piano soundboard is about 1/2 to 3/8ths of an inch thick and stiffened by wooden ribs glued on underneath. The idea is that the whole board acts like a large speaker, rising and falling evenly as the vibrations from the strings are passed to it through the bridge. However, as perhaps you can imagine, reality is different. The soundboard breaks up into many smaller vibrating sections, large and small and often oddly shaped. This can be seen by fancy-assed flouro something or other, or by simply spreading sand. Steingraeber spreads a fine sand on the installed soundboard and activates it by tapping on it in various places with a rubber mallet. The sand moves as the soundboard vibrates and collects in a pattern of lines. These lines are the stiff areas, and the sand collects here after being vibrated off the soundboards active parts. Steingraeber shaves the thickness of the soundboard along these lines or nodes, decreasing the stiffness. By repeatedly doing this, they end up with a board where the sand all migrates to the outer edge meaning (supposdly) that the board is vibrating much more like a large single piece of wood. This is fussy and time consuming, but the Steingraeber sound is marvelous and this has to be part of the reason, maybe a big part. It’s cool and I never gave it much thought beyond that. One thing I do not know is how much wood is actually removed and how thin those shave nodes get? I have seen soundboards so thin you can see shadows showing through from the other side, but that was on a Neupert harpsichord and piano soundboards must resist far more pressure. I have two tuning clients who own Steingraebers and both have been complaining (politely) about tuning instability. One is a model 170 which is about 2 years old and is in the home of a serious player who also has a Bluthner model 2. Both pianos have humidity systems, get tuned a minimum of 4 times a year and have been under my personal care. There is no question that in the winter especially the Steingraeber goes out of tune much faster, despite my best efforts to set the strings and pins. The Bluthner meanwhile holds like a rock and barely moves. These two pianos are quite different in size, but the difference in stability is clear. The second client has a Steingraeber 192 which I have only recently begun to service. This piano has also has a carefully monitored humidity system which was installed before delivery some 5 years ago. She expressed frustration with the same tuning instability in the winter. It is not a dramatic out-of-tuneness, the slight unison drift is noticeable on such a clean and clear sounding piano. While pondering these two cases, I had a sudden realization: maybe it’s that soundboard shaving! The same procedure that makes the soundboard vibrate with more flexibility may, perhaps, mean that the soundboard moves more with humidity fluctuations, even small ones. This is completely not a big deal for the Steingraeber appreciator. 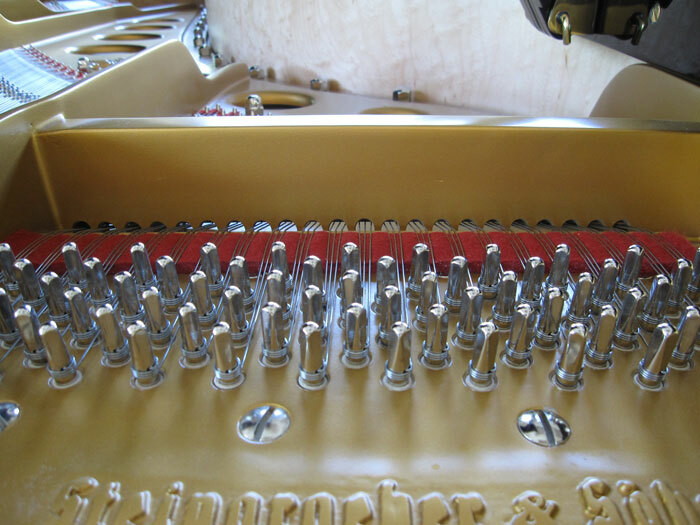 ALL high end piano makers have their quirks and personalities. My experience has that by adding a room humidifier in addition to the piano lifesaver system, the fluctuations decrease substantially. And if you’re going to squawk about having me visit often, you should have bought a digital.